Traded along with backup catcher Erik Kratz from the Phillies in exchange for Blue Jays reliever Brad Lincoln. Not quite a journeyman even by baseball standards Rasmussen is as well-traveled a prospect as you are likely to find, having racked up more than a few frequent flier miles over the last couple of years. Picked in the 2nd round of the 2010 amateur draft by the Florida Marlins out of UCLA, John Sickels of Minor League Ball rated him as the 6th best prospect in the system the following offseason. In 2012 Houston would acquire Rasmussen along with minor league third baseman Matt Dominguez from Miami in the Carlos Lee deal in June of that year, only to flip him in the offseason to the Dodgers for pitcher John Ely. 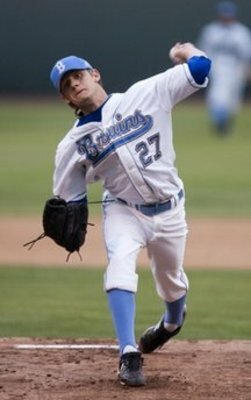 Rasmussen, who was previously drafted by the Dodgers out of high school, would stay with the organization for almost all of 2013, making it all the way to the team’s Triple-A affiliate in Albuquerque and even being rated as their 17th best prospect by MLB.com before being dealt at the eleventh hour of the waiver trade deadline to Philadelphia for Michael Young. A small left-handed starting pitcher (think Marcus Stroman small), Rasmussen has shown pretty good durability for a pitcher over his short pro career throwing over 130 innings in every full season since being drafted. Rasmussen has a compact delivery and throws from a three-quarter arm slot. He features a four-pitch repertoire which includes a fastball in the 88-92 range (with a peak of 94), a curveball, slider and changeup. The changeup is a fringe-average pitch, but the two breaking pitches project to solid-average, with the slider being the closest he has to an above-average offering. More of a finesse type pitcher, Rasmussen tends to be over-reliant on his offspeed pitches to generate outs, and will nibble with his fastball a bit leading to higher walk rates than one would like. He does a pretty good job of keeping the ball on the ground for a pitcher with very little natural plane on his pitches, posting a respectable career 42.5GB%. Rasmussen has a 14.7KS% to 4.2KL% in his career suggesting that he gets the majority of his strikeouts swinging. He has also had slightly more success against lefties than he has against righties in his career, allowing right handed batters to hit a for an OPS of .743 compared to only .648 for left handed batters. He will start next year with the Blue Jays’ Triple-A affiliate in Buffalo as a 25-year-old, and provide solid pitching depth either in the bullpen or in the rotation, depending on what the Jays decide to do with him (the Buffalo rotation will already include former first round picks Deck McGuire and Marcus Stroman, prospect Sean Nolin, and perhaps big-leaguers Kyle Drabek and Drew Hutchison). Rasmussen put up solid numbers with the Dodgers Double-A team in 2013 (8/k9 to 3.9/bb9), and despite benefiting from a fortuitous .256 BABIP, his overall numbers were still pretty good as indicated by his 3.27FIP. He was hit around a bit after being promoted to Triple-A, but given that he was pitching for the first time in the notoriously hitter-friendly Pacific Coast League, the numbers should be taken with a grain of salt. He will have to be added to Toronto’s 40-man roster or will be exposed to the upcoming Rule Five draft. What it basically comes down to is Toronto trading an older, more expensive reliever (Lincoln) for a younger, cheaper starter with a full six years of control remaining, plus minor league options. There’s certainly value in the deal from that standpoint alone. I believe Rasmussen has a shot at being a fourth starter (though perhaps not in the AL East) if he can harness his command and attack hitters more often with his fastball. If neither of these things happen, he still provides a cheap lefty relief option out of the bullpen where his stuff would play up and his breaking ball would be even more effective.